Spiritual Emergence or Spiritual Emergency... what will you choose? Help yourself and others learn how to use the Universal Medicine Wheel as a life compass to find direction and momentum on your journey. Learn experientially by doing... to lead your own Addiction Alchemy: Inner Journey gatherings. Help us bring this powerful tool to people everywhere, as a grassroots movement to help people go Beyond Sobriety and Beyond Anonymity. 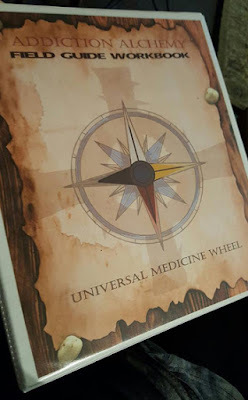 The Addiction Alchemy Universal Medicine Wheel can help bring your body, mind and spirit back into a state of harmony, reconnecting you to parts of your SELF that have been forgotten or are evolving, re-establishing the knowledge of your interconnection to all that is. Using the process of life itself, people, animals, the earth and all our relationships we rediscover who and what we truly are. In this monthly INNER JOURNEY gathering you "Become The Tracker" in your own life, learning how to read spiritual messages that are all around you, tap into the power of animal guides and archetypes, learn about Sacred Ceremony, working with the Land, Prayer, Meditation and Intention, Music, Energy Work, Creativity and what is required to bring your consciousness into wholeness, through the map of the Universal Medicine Wheel. Finding and opening to your personal medicine means that you are stepping into your purpose. Nothing restores power like knowing who you are and being in right relationship with yourself and all that is. The Universal Medicine Wheel provides the forum and the framework to draw together true communities and raise up the Medicine People of those communities to become empowered in a humble and good way to take their rightful place as spiritual stewards. As you feel called to lead your own circles, you embark in the initiatory process of serving your community in spiritual partnership as soul groups. Serving in this way, drawn together through the Universal Medicine Wheel and a spiritual guide or animal totem, brings great inner power to the people, which brings not only healing, but enlightenment, peace and true love to all. Addiction Alchemy and the Universal Recovery Medicine Wheel doesn't directly approach addictions per se, but rather acknowledges the process of addiction within all of our lives, focusing on the remembrance of all the parts of the self to restore wholeness. We all have ancient, ancestral or karmic ties and attachments, patterns and imprints. We believe that all recovery is a recovery of the True Self... and it is from this place that true healing and growth occur. Soul Recovery is Soul Retrieval. This monthly gathering/training provides support to the public, as well as continuing support to our community of Addiction Alchemy Field Guides. It is a great way to learn how to lead your own circle, as well as receive support! Addiction Alchemy Field Guide Workbook can be purchased for $25. Field Guides may purchase bulk worksheets for their classes. For more information please visit www.AddictionAlchemy.com or call Rev. Renee Bledsoe at 239-560-6314. 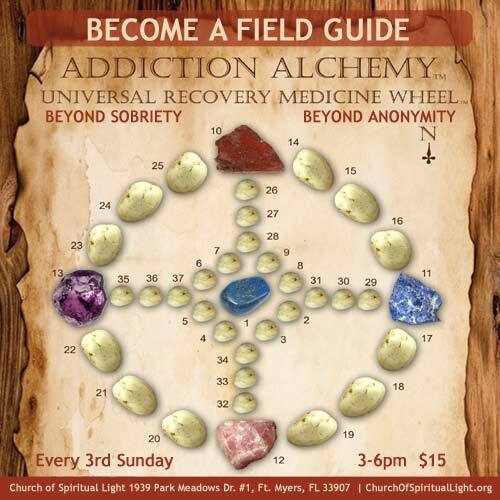 Addiction Alchemy Field Guide Workbook now in stock.